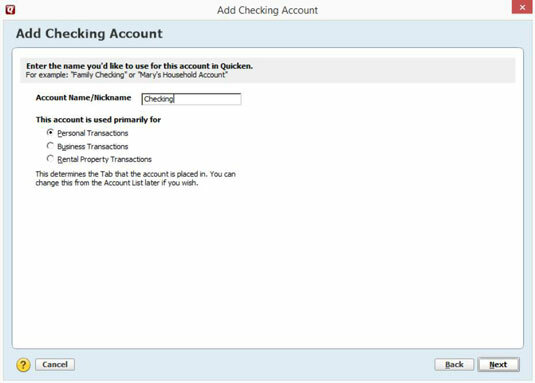 If you haven’t used Quicken before or are starting from scratch, the first time you start Quicken 2015, the program shows the Add Account dialog box, which you use to tell Quicken about the accounts you’ll track. 1Click the Checking hyperlink (it appears at the top of the little list of accounts under the Spending & Saving heading) to provide information about your primary checking account and its current balance. The figure shows the window that collects the first part of this information. 2Identify the financial institution — usually a bank — by typing your institution’s name in the text box provided. As you type, Quicken displays a list of financial institutions that match what you’ve typed so far. The more you type, the shorter the list of possible matching institutions. 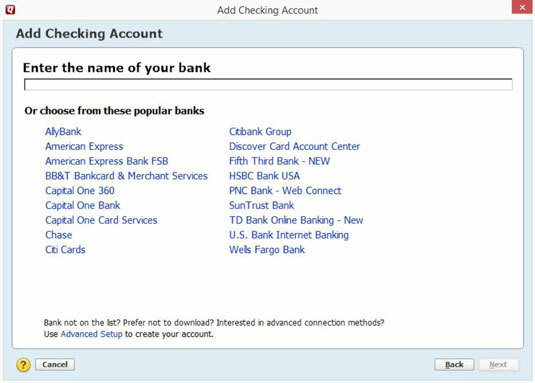 Note: When you start the Quicken program, it attempts to make an Internet connection so it can grab the most up-to-date version of this list of financial institutions. 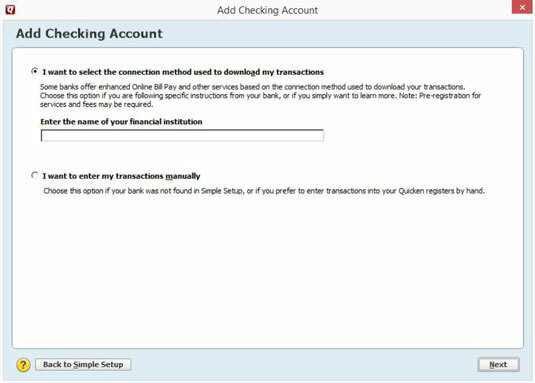 3Tell Quicken whether you want to download transactions directly from your bank or enter transactions manually. If your bank provides Internet access to your bank account — and most banks do — Quicken knows. And as a result, Quicken attempts to not so subtly push you into just grabbing data from the bank’s website. You should maintain your account manually. You have plenty of time later to find out how online banking works. That said, however, if you see your bank listed and you want to use online banking, select the bank and click Next. When you click the Next button, Quicken displays another version of the Add Your Primary Checking Account window, which asks for the username and password required to access your bank account electronically. To download transactions and account balance information directly from your bank’s website, you need to provide this information. After you provide this information, click the Connect button to test the username and password information. 4If you don’t want to use online banking quite yet, and are happy to start slow and go manually at the beginning, click the Advanced Setup hyperlink at the bottom of the first Add Your Primary Checking Account window. Quicken won’t quite believe you’re bold enough to ignore its strong advice to go digital, so it displays another Add Your Primary Checking Account window that provides option buttons you can use to indicate that you want to be clever and just download transactions — or that you want to be ploddingly cautious (at least at the start) and enter transactions manually. By default, the I Want to Select the Connection Method option is selected. But you don’t want to be clever — or at least not quite yet — so select the I Want to Enter My Transactions Manually option. 5Tell Quicken the name you want to use for the checking account. You do so by typing a name in the Account Name/Nickname text box. Furthermore, if given the choice, click one of the option buttons that may appear below the Account Name/Nickname text box to indicate whether you’re using the bank account primarily for business finances, personal finances, and so on. Brevity is a virtue here, so be concise: Quicken uses your account name to label stuff within the Quicken window and on Quicken reports. If you use a long account name, the name may not always fit on reports and screens. 6Enter the ending bank statement date by referring to your bank statement. 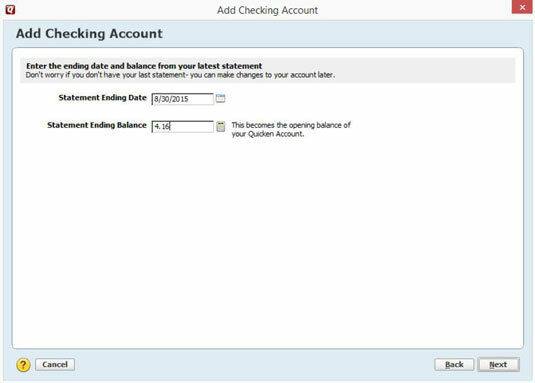 After you provide Quicken a name and general description of the account’s transactions, click Next, and Quicken displays another account setup dialog box that asks about the account’s ending statement date and ending statement balance. Enter the date of your last bank statement in the Statement Ending Date text box. This date, by the way, is the date forward from which you will start using Quicken. Enter the date in MM/DD/YYYY or MM/DD/YY fashion. 7Enter the ending bank statement balance by referring to your latest bank statement. This balance is whatever appears on your bank statement. This balance is also the amount of money in your account on the date you begin your financial recordkeeping. If you have $4.16 in your checking account, type 4.16 in the Statement Ending Balance text box. 8After you type the bank statement balance, click the Next button to continue moving through the account setup. The Account Added window also provides buttons you can click to add another bank account (including things like credit card accounts), as well as a button you can click to indicate that you’re finished and just want to start using Quicken. 9If you have several other bank accounts that you want to set up within Quicken, repeat the preceding steps for each account. Just click the button that refers to adding another bank account.